Why Are The Eagles Working On The Nest? 2016 note: The winter of 2014 was mixed. To date, the winter of 2016 has been far warmer than normal. Click here for a synopsis of 2014/2015 - the season this blog was written for. 2016 is starting much like 2014, so it will be interesting to see how we finish. Why are the eagles working on the nest? Are they predicting a hard winter? Does nestoration frequency or intensity signal a snow and cold yet to come? These questions have turned up in a few places recently. It appears that the recent flurry of nest activity does not signal another unusually cold, snowy winter, although it looks like might get one anyway! So why are the eagles in Decorah and Fort St. Vrain working on their nests? Among non-tropical birds, many activities (reproduction, molt, migration) are linked to daylight length. We've primarily discussed the photosensitive period of bird life here, when daylight lengthens, gonads start swelling, and human watchers start counting the days until eggs are laid. However, birds also have a photorefractory period that in many northern birds begins slightly prior to summer solstice in mid-June. Gonads start shrinking, a new hormonal regime takes precedence, and many northern birds start preparing for winter. This might include social behaviors like flocking (something many mid-westerners start seeing in August), the cessation of care for fledglings, serious eating in preparation for migration, and dispersal from home territories. Researchers are quite sure that gonadal changes drive vernal (spring) behavior, but autumnal behavior is a lot harder to figure out. 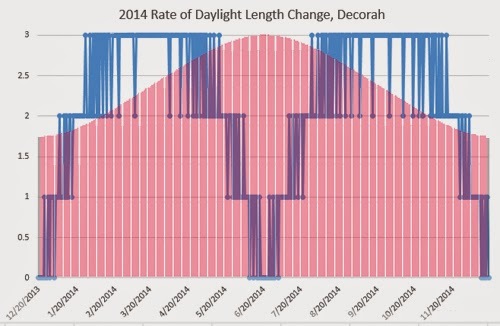 Since daylight length is so important, we should probably chart it, right? We'll start with Decorah's photo-period from December 21, 2013 to December 20, 2014. 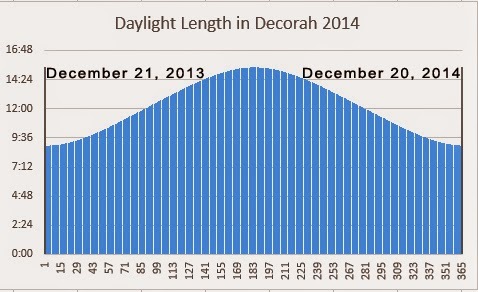 At Decorah's latitude, the cycle of 365 days plots into a nice bell curve that looks something like this. Of course, there are other ways to plot daylight length. What happens if we consider each month separately? That graph yields a more complex pattern. Some months are rising, some months are falling, and daylight length is approximately equivalent on several days in spring and fall. For example, Decorah enjoyed 10:49 hours of daylight on October 20...very similar to February 20, with 10:44 hours of daylight. We'll get back to that soon. Let's break it down even further. Figures one and two plot daylight length. But what does it look like if we plot the rate of change instead? Do change rates also influence photosensitive and photorefractory periods? 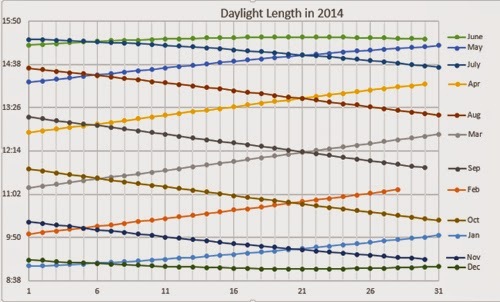 This graph shows the rate of change compared to overall daylight length across one year. The flat planes show time periods where daylight length is changing at a steady rate: +3 minutes per day at the top of peak one, and -3 minutes per day at the top of peak two. The valleys display transient states where daylight length is changing more rapidly, with the exception of the zero plane that occurs around each solstice. For many birds in northern latitudes, the photosensitive period occurs primarily in cycle one and the photorefractory period occurs primarily in cycle two (with a little overlap into the tail end of cycle one). So why are they working on their nest during the photorefractory period, especially if weather prognostication isn't involved? A few thoughts. The eagles might be influenced by daylight length. Daylight length is quite similar in mid-February and mid-October. This might encourage bonding activities in the photorefractory period that echo those in the photosensitive period, especially between territorial mates. The eagles might be impacted by Zugunruhe (migratory restlessness, which is also influenced by daylight length). I know Mom and Dad don't migrate, but many eagles do. Perhaps the suite of behaviors and hormones that direct migration in some birds influences our eagles to return to nest-building. Both adults certainly seem to have nest-building restlessness! The eagles might be influenced by memory. Yes, light is the most important zeitgeber in Mom and Dad's world. However, study after study has shown that birds learn, remember, and draw on experience. Could last year's brutal winter be influencing this fall's flurry of nest preparation? Light might be the most important zeitgeber in Mom and Dad's world, but it isn't the only one. In addition to dwindling hours of daylight, a flat-lined change rate, and no real photosensitive period day length matches, our eagles will be coping with cold and snow. As happened last year, we expect to see less of them until their gonads fire back up following winter solstice. Stay safe, Mom and Dad! We look forward to seeing you whenever you visit! I got curious about daylight length in NE Florida since the eagles there just laid egg number one. How long are their days right now as compared to Decorah? The US Naval Observatory tells me they had ten hours and 33 minutes of daylight today, as compared to nine hours and 36 minutes in Decorah. Interestingly enough, our eagles lay eggs when we have roughly ten hours and 44 minutes of daylight. While eagles are influenced by other zeitgebers such as health, food availability, and age, this underscores the important role that photoperiod plays in the lives of our birds. It's pretty straightforward to calculate photoperiod for the Decorah eagles, since they don't migrate and live at a latitude with obvious photoperiod changes. But how about connecting photoperiod to physical changes in the Arctic Tern, a bird that annually migrates from Greenland to Antarctica? Or the Kiwi, a nocturnal bird? How about birds that live in places like American Samoa, which has a shortest day only 1 hour and 41 minutes shorter than its longest day? The more I watch birds, the more questions I have about them. Personal communication, Bob Anderson. Thanks for the lesson on photoperiodism! Astronomical Applications Department of the U.S. Naval Observatory: http://aa.usno.navy.mil/index.php. If you like charting, this site is worth a visit. Paper: Circannual rhythms in birds, Eberhard Gwinner. Current Opinion in Neurobiology 2003, 13:770–778. Paper: Gwinner E, Scheuerlein A: Photoperiodic responsiveness of equatorial and temperate-zone stonechats. Condor 1999, 101:347-359. Paper: Dawson A, King VM, Bentley GE, Ball GF: Photoperiodic control of seasonality in birds. J Biol Rhythms 2001, 16:365-380. Book: Living on the Wind: Across the Hemisphere With Migratory Birds by Scott Weidensaul. This would make a great present for the bird-lover in your life! Book: Sync: How Order Emerges From Chaos In the Universe, Nature, and Daily Life by Steven Strogatz. Another great book, although it isn't about birds!